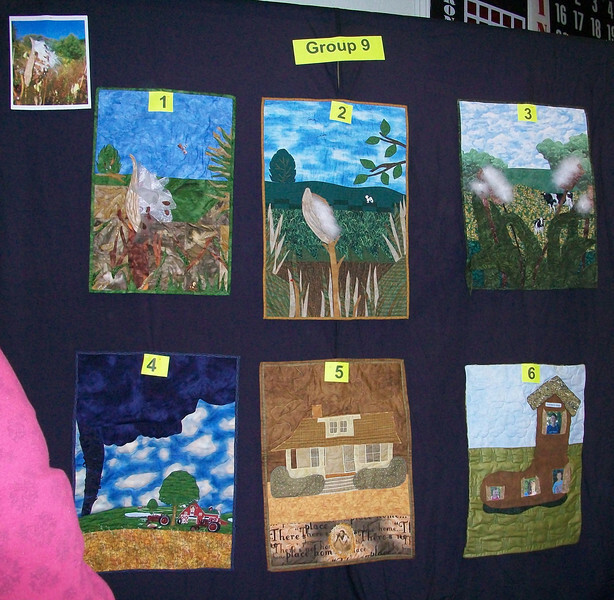 2010 Challenge: 9 groups of 6 quilters each. Each quilter to make an 18 x 24" interpretation of the quilt before. The first quilter of all groups started with a photo of a bursting milkweed pod. 10/2010 Piecing Partners Whisper Challenge Group 9. Quilter1-Milkweed pod in landscape. Quilter2-Again. Quilter3-With cows. Quilter4-Farm with tornado (another lady from KS). Quilter5-Dorothy's house. Quilter6-Self portrait or quilter's house.